Soft, bite-size balls of exotic dried mango blended with tropical coconut and covered in creamy Belgian milk chocolate. Original snack explorers. Discover, make, eat. Suitable for vegetarians. 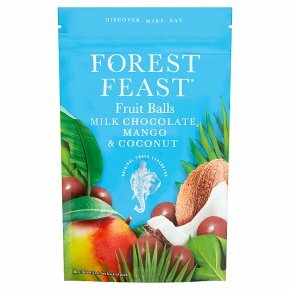 Discover Africa's idyllic tropical climate is perfect for growing the delicious, sweet dried fruit used in our Forest Feast Fruit Balls. Responsibly sourced from smallholder farmers, the fruit is blended and shaped to form the fruit balls at the heart of this product to create a truly indulgent taste sensation.